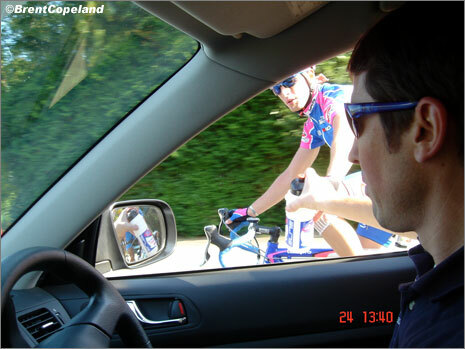 PezCycling News - What's Cool In Road Cycling : Lampre DS Brent Copeland Gets PEZ’d! Lampre DS Brent Copeland Gets PEZ’d! 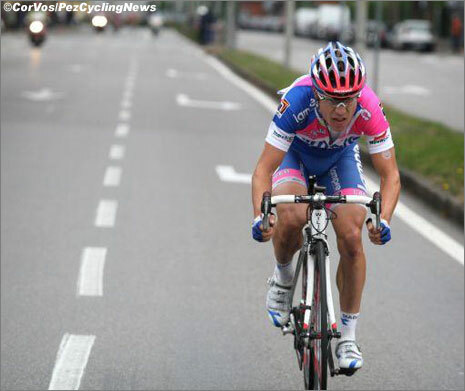 Damiano Cunego is a great Classics rider, but is no longer a Grand Tour contender; right? Wrong! According to the man who trains him - and is also his DS - the 'Little Prince' is rarin' to go for this year's Giro. South African, Brent Copeland recently gave us a unique insight into the world of Lampre. PEZ: Did you ever race, Brent? Brent: Yes, for the South African national team and for the Swiss team, VC Lugano. I'd raced in the area with the SA team and loved it so much that I decided to stay. I set myself the target of turning pro by the time I was 25; I didn't achieve that so I went into the management side of the team. The team amalgamated with a Japanese sponsor and I did masseur's and trainer's courses so as I was well equipped to look after the Japanese riders. PEZ: How did your Lampre gig come about? Brent: I arranged for Robbie Hunter to come over and ride for Mapei and when the team 'morphed' into Lampre he moved there. At around that time the Japanese guys at Lugano moved to France, and I was out of a job. I approached Robbie and he got me the job at Lampre - I got him a job, then he got me one! PEZ: You're a partner in a bike shop too, aren't you? Brent: Yes, Comobike in Como; it's very difficult to find the time for everything. 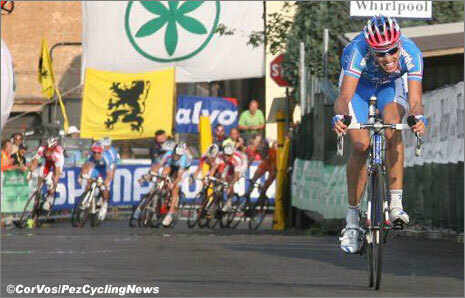 In 2004 the Saeco and Lampre squads amalgamated; there were seven DS and I decided to take a step back, voluntarily. In return for that, we were given exclusive rights to sell Lampre merchandise from Comobike. I was still on a 'day contract' with them; that means that they would use my services as they required them, a day at a time - maybe 30 to 40 days per year. During that time we expanded the shop, set up the website and began organised bike rides from the shop. This year, two of the DS's, Bontempi and Martinelli moved on - they were meant to go to Amica Chips, but it didn't come off - so I came back on a full-time basis. PEZ: That's ten years with Lampre - what are the main changes in the sport? Brent: Yes, six full time and four on the 'day contract' basis. There have been huge changes as far as training goes; power is the thing now, not heart rate. Racing has changed enormously; the season starts so early and finishes so late. But all that said, it's still a very traditional sport. PEZ: What's the main quality a DS requires? Brent: To be able to find the fine line between friendship and respect, if you can work that out, you'll do just fine. As a masseur, you can be a rider's friend, but as a DS you can only be friends to a point, there has to be respect. It's a difficult balance, but you have to try to find it. Then there are the organisational skills; but not so much training in-put now, all the riders have a trainer within the team or an external trainer. : Talk us through a DS's day, please. Brent: It starts the night before really, when you sort out all the wake up times, worked back from the start time. You'll go round every rider in their room and talk to them - have they recovered; what the plan is for the next day. Then it'll be dinner and an early bed. In the morning you'll follow the programme you framed the night before; talk to the mechanics and soigneurs about who's doing the feeds, who's taking the baggage to the hotel. Breakfast is three hours before the start and arrival at the start is one hour before. The team talk will be in the bus, on the way to the start; 15-20 minutes - who's being looked after, what the plan is for breakaways, discuss the climbs, how the sprint will be conducted. Then the race starts and you take it as it comes! On long stages, you'll be in the car for 10 hours; it's tiring, but you fall into a routine. 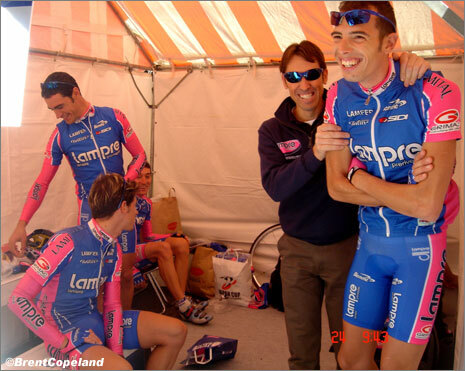 Lampre is like my second family; Giuseppe Saronni is nice man, he looks after everyone well. PEZ: Is Cunego a classics man, now? Brent: No! Most journalists say this, but if you look at the test results and his characteristics, he's more of a Tour man than a one day rider. He's a nervous rider, he's always thinking about the opposition, the stages - he has to learn to relax; I feel that's been the problem. I think he's maturing though; I'm looking after him and the sensations are very positive. He's so classy; he's good in classics because he can give everything on the day. He's two or three kilograms lighter this year, he's been working hard in the gym and is very focused. He has a good team around him for Grand Tours - we have the climbs and the TTT covered; it's our strongest team in years. Brent says to watch for Cunego in the Grand Tours. PEZ: 'Bruz' Bruseghin - is he as 'laid back' as he seems, and can he win the Giro? Brent: He's a mountain man, very laid back, cool, he takes it one day at a time, as it comes and his recovery is unreal! For him to win would be difficult, he has the ability, but Damiano is team leader, so it's all down to what happens in the team. Bruz: a mountain man, very laid back, cool. PEZ: Has Alessandro Ballan changed at all, now he's wearing a rainbow jersey? Brent: No, he's very relaxed, he's taken to it very well. They say that the rainbow jersey brings bad luck, but it's not the jersey, it's the things that go with it. When a rider wins the Worlds, his agent will be very keen to cash in and there are so many appointments to meet - maybe the rider only has time for three hours on the bike, instead of five? Alessandro is from the same part of Italy as Bruz, he's a relaxed and well educated man. He knows he has to respect the jersey and honour the invites he receives; he's trying to do this but also his work on the bike. He's very relaxed, but had to change his mobile phone number, he said it just became crazy. PEZ: Lampre - big team, big riders, big egos? Brent: No, fortunately not; Ballan and Cunego have different characteristics and hardly do races together. We have Gasparotto this year, I don't know what he's like, but it's been explained to him that Cunego is team captain - although he'll have his days. They are all champions and like all cyclists, they love to win. I'll know better how it's all going to work out after our first training camp. PEZ: Who's the most dedicated rider on the squad? Brent: Cunego - to people outside, it might not seem like it; but if you say four hours on the bike, he'll do four-and-a-half; tell him 60 minutes in the gym, he'll do 90. He's been targeting Liege-Bastogne-Liege since November. But they're all professional, all different, all conscious of how lucky they are to be doing what they are doing. PEZ: Who's the equipment fanatic? Brent: We don't really have one - Simoni was fanatical about his bike, Cunego looks after his equipment, but not to the extent that Gilberto did. Damiano's bikes are all custom made - he has very short legs and a long upper body so he needs a short head tube but long top tube. Simoni was fanatical about his bike with Lampre, but now he likes to relax with the ladies. Brent: There are quite a few, but Santambrogio and Bruz are always laughing. PEZ: What do you like best about your job? Brent: Being passionate about cycling, doing something I love; and I get a lot of satisfaction from results, from rider's hard work. Brent would like to see Cunego vying for top spots at a Grand Tour and some more one-day success from Ballan. 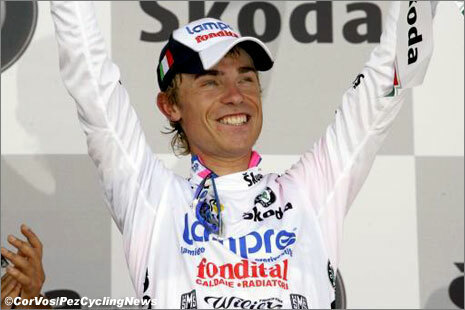 PEZ: What do you want Lampre to achieve in 2009? 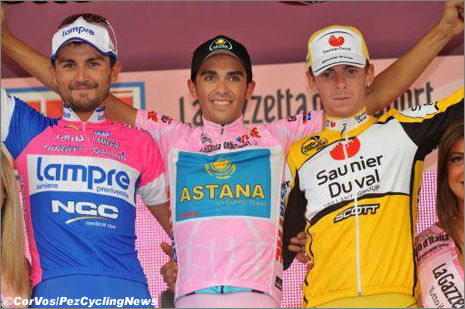 Brent: A big tour win - the Giro or Tour, from Cunego. For Ballan to have a good classics season. And for us to win the Worlds; I think Damiano has a great chance, he knows the circuit and he has a lot of ambition. PEZ: Finally, does Giuseppe Saronni have a wardrobe assistant? He always looks so dapper! Brent: No, no! Giuseppe is the most down to earth, non materialistic man you'll ever meet. He works on his house at weekends and is very approachable. But he does have that Italian sense of wanting to look after himself. 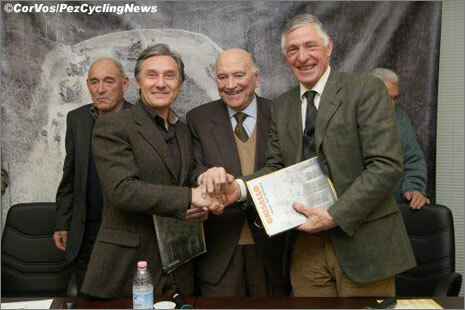 Beppe Saronni, left, at the Ghisallo with Signor Moser. With thanks to Brent for his insight into one of the world's top teams. But just look at those expectations - a Grand Tour, Classics and the Worlds! 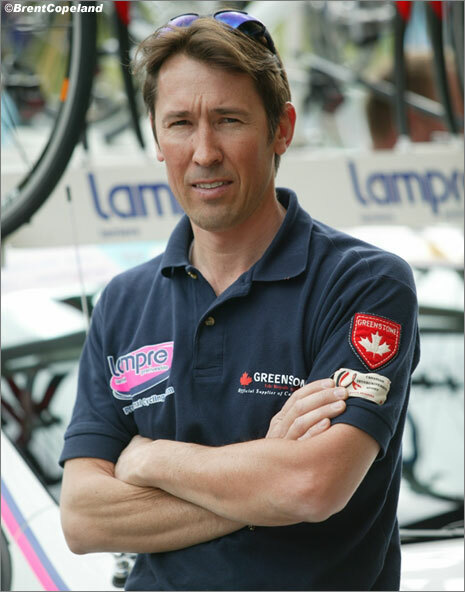 Mega team, mega pressure - we wish him, Damiano and Lampre all the best for 2009.